LAWRENCE, Mass. 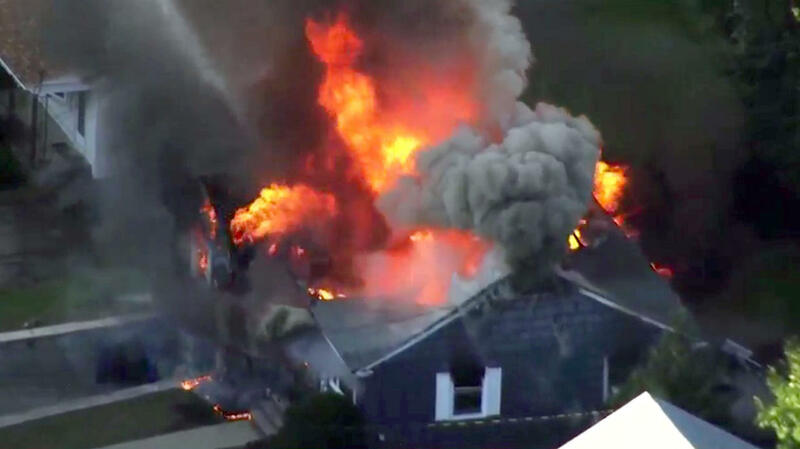 -- A Massachusetts utility company says it will "work tirelessly to restore service" after a series of gas explosions an official described as "Armageddon" killed a teenager, injured at least 25 other people and ignited fires in at least 39 homes in three communities north of Boston. The blasts forced entire neighborhoods to evacuate as crews scrambled to fight the flames and shut off the gas. Emergency management officials believe over-pressurized gas lines triggered the fires, but investigators have yet to reveal an official cause, CBS News' Kenneth Craig reports. Massachusetts State Police urged all residents with homes serviced by Columbia Gas in Lawrence, Andover and North Andover to evacuate, snarling traffic and causing widespread confusion as residents and local officials struggled to understand what was happening. On Friday, Massachusetts Gov. Charlie Baker declared a state of emergency. He said he made the declaration so the state could take over recovery efforts. CBS Boston reports that residents received automated emergency phone calls urging them to leave their homes. Power was being shut off to the entire communities of Lawrence, Andover and North Andover. All Columbia Gas customers in South Lawrence, Andover and North Andover were told to evacuate their homes. Red Cross reception centers were setup at the Andover Senior Center and Youth Center, North Andover High School, as well as Parthum and Arlington Schools in Lawrence. Early in the evening, Columbia Gas customers were urged to turn off the gas service to their homes. Gas shutoff valves can be found on the pipe leading from the ground to your gas meter, or on the service line between the meter and the home. Later Thursday night, Columbia Gas issued a statement asking people not to turn off their own gas, and not to open windows to ventilate. Teams consisting of gas technicians, fire and police personnel were going door-to-door to make sure the gas is shut off to about 8,600 meters. Once gas service is turned off, do not turn it back on unless instructed by emergency personnel. Any electric sparks or open flames can ignite natural gas in the air. If you have power and smell gas, do not turn any electric appliances on or off. Refrain from using your home phone, cell phone or a flashlight if you smell gas. Updates on gas service, electric service and shelters are being provided by various town emergency departments on Twitter: North Andover Twitter | Lawrence Twitter | Andover Twitter. You can also call 211 for updates.